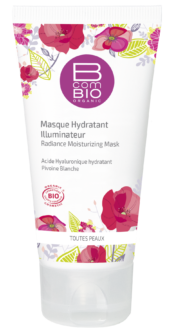 This certified organic moisturising cream mask brings concentrated moisturisation and tone to dehydrated, tired skin. Plant sugars from beetroot provide instant, lasting moisturisation, acting as water “transporters” within the cells. Tara gum maintains the moisture level by reinforcing the skin’s protective barrier. Organic orange extract, rich in vitamin C and fruit acids, leaves the skin glowing. A blend of essential oils with refreshing, soothing properties transforms this care into a moment of pure relaxation. The Radiance Moisturizing Mask provides an instant moisturising effect. The skin is supple and glowing. The complexion is fresh and radiant. Apply the Radiance-Enhancing Moisturisation Mask twice a week to the face and neck. Leave for 10 minutes. Remove any surplus with a paper handkerchief. Water, Organic orange extract**, Organic hazelnut oil*, Glycerine**, Sunflower oil**, Squalane (from the olive)**, Beetroot extract (Betaine)**, Emulsifiers**, Thickening agents**, Moisturising active ingredient from tara extract (tree from Peru)**, Blend of essential oils**, Vitamin E**, Preservatives, Fragrance**. 99.4% of the total ingredients are natural or of natural origin. 98.8% of the total plant ingredients are from organic farming. For enhanced effectiveness, exfoliate beforehand with Gentle Exfoliating Cream. Gently rinse off the mask with warm water then use Toning Lotion to eliminate scale from hard water.